Before my rant, I must ask: Why do republicans insist on pushing this stupid family down our throats? Bill Clinton had to rescue our economy after Bush I ran it into the ground, and now after several years, President Obama has finally pulled us out of the economic train wreck of Bush II. So who is the current the GOP frontrunner? Bush III. You realize that if JEB is able to pull of a win, (which is within the realm of possibility given the fact that the Kochs raised $249 million to help the GOP at a one-day summit last week), we'll have had 36 years of every GOP president being from just one family. One very, very, AWFUL family. Nonetheless, W's younger brother still has PLENTY of problems that he must overcome. The one problem he hasn't had to deal with is one he's been trying to hide for years: his genetically inbred incompetence streak. That might be changing. For as hard as he tries, John Ellis Bush just can't hide being a Bush. First, he decided it was a swell idea to hire Ethan Czahor as his technology chief. Ethan is a mysoginst and racist (who was nonetheless fiercely defended by fellow conservatives). 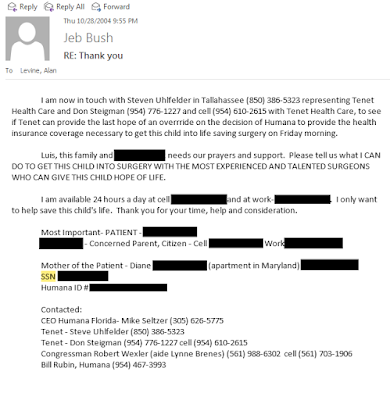 JEB knew this guy had called women "sluts", made fun of gays, and said African-Americans spoke "gibberish", but went ahead and hired him anyway hoping no one would notice. After the media firestorm, (and ONLY after), did Bush accept his resignation. In an attempt to paint himself as transparent, Bush released thousands of emails from his time as governor. Obviously, he vetted many of them because the most damning ones, like the emails eliciting help for Bacardi in return for campaign donations, couldn't be found in the 300,000 emails he released. However, many of the emails he did release contained people's names, birthdates and social security numbers: everything you need for an identify theft. 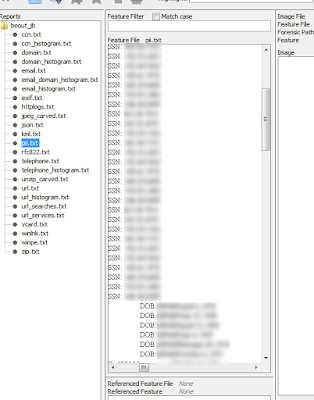 He also released people's phone numbers, home addresses, and email addresses. There are too many to go over, but this one gives you an idea. A healthcare representative gave information about a child with a life-threatening medical condition, including the mother and child's name, phone number, social security number, and healthcare identification number. It would have been nice if team JEB had bothered to put a minimum level of effort to delete sensitive information. At least they could have put as much effort into it as they did in deleting past offensive tweets. Oh, dear. Can you imagine what he might do as president? No, no, no....not another Bush!!!!! I get your point and agree with it, but 36 years of presidents from one family? Where did you get that number? George H. Bush was president for four years. George W. Bush was president for eight years. That equals only 12 years. 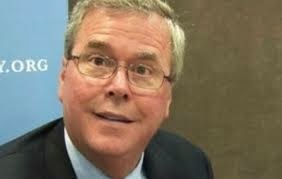 If Jeb wins, he is elected for only four years, so let's add that, and we have 16 years. He may or may not be a two-term president so including a second term isn't valid unless you clarify that it may or may not count. Let's say he does win a second term, that totals 20 years of the Bush family in the oval office. So where did you get 36? Easy. First Bush was elected in 1988. So 1989-2024 (assuming the possibility of 2 terms) is 36 years. Article said 36 years where every GOP president was from one family. And there were no GOP presidents other than the 2 and potentially a third during that 36 year period. Your 20 years of Bushes and 8 for President Clinton and 8 for President Obama make 36. Simple math. JEB must have had lawyers in mind when his administration released all those people's personal data over the totally insecure Internet in complete disregard for the likelihood that people's identity would be stolen, their credit ruined, and their lives disrupted. What's important, of course, is all those political contributions and favors that the Jebster and other GOPers receive from lobbyists and various bigwigs like the Kroch Bros., and all those lucrative lawsuits that may be filed by those lawyers, including JEB's cronies, on behalf of their clients and themselves, and the millions of dollars they may rake in at taxpayer expense.